When her prodigal brother’s return to Yancey, Alaska, is shattered by his arrest for murder, Piper McKenna is determined to protect him. 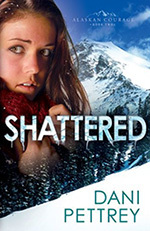 When Piper launches her own investigation, Landon realizes he must protect her from herself — and from whatever complications await as the two follow clues deep into Canada’s rugged backcountry. Not only does their long friendship seem to be turning into something more, but this dangerous case is becoming deadlier with each step. When I was introduced to Piper and Landon in the first book of this series, I knew that I wanted to read more about them. This author did not disappoint me. I absolutely loved their story. As with the first book, this one was filled with suspense, romance and a good faith message. The tension between Piper and Landon as they were discovering their feelings for each other kept me turning the pages. I was hooked trying to figure out who the killer was. I just loved Piper McKenna. From the first time I was introduced to her in book one, I thought she was such a wonderful person. I think her loyalty to her family as well as her empathy for others was what I found most appealing. I would love to be her friend, but I think her adventurous streak would be too much for me. I would have to live vicariously through her. Landon Grainger was great to get to know. He was meticulous about doing things by the book so that justice would be served by catching the true killer. He struggled longer about his feelings for Piper than she did, but I was rooting for him all the way. I also loved the back and forth between them as they battled wits. The best relationships are built on solid friendships and they had that. I liked everything about this book, but I think it was Piper’s personality that I enjoyed the most. That, and the witty commentaries with Landon. Oh yeah. This book has well written characters, a good faith message (not the kind that hit you over the head), and fast-paced suspense. This is the second book in the series and it is a standalone story. Having said that, I would highly recommend reading the first book in this series prior to reading this one because you get a great introduction to Piper and Landon’s story as well as the rest of the McKenna family.